TSPSC Village Revenue Officer Admit Card 2018: Telangana Public Service Commission is conducting the Direct Recruitment Drive to hire the young fresh talent on the vacant posts of Village Revenue Officer. 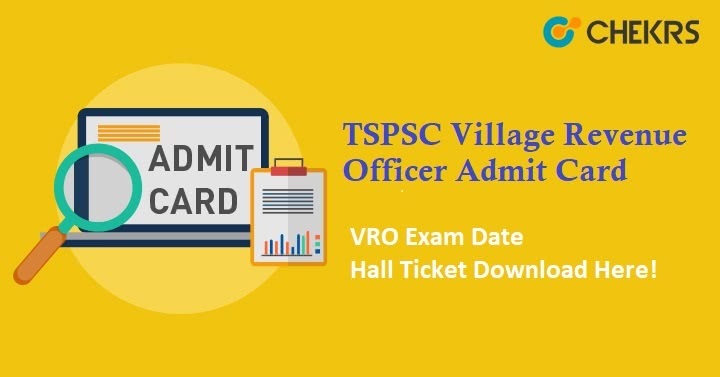 We will provide you the direct links to download the TSPSC Village Revenue Officer Admit Card 2018 PDF after it get uploaded on the official page. You can apply for the exam from the online portal of TSPSC. By the way, the TSPSC VRO Exam Admit Card is expected to publish approx. 7 days before the exam. The candidates will not be able to enter in the exam hall without the admit card. You will have to collect your TSPSC VRO VRA Admit Card 2018 from the online portal only and no offline services such as currier facility, speed post etc. will be provided to get you the admit cards. On the other hand, you will certainly be informed about Telangana VRO Exam Hall Ticket via mail or message on your registered mail id or phone number. Click on the direct link provided on our site or you can open the online portal of TSPSC. Go to the Student Corner. Click on “Admit Card” option. Select the link of concerned exam admit card. Save or download the appeared page. Keep 2 to 3 printouts of it with you. The Public Service Commission has announced the exam date for the recruitment exam. Check the details given in the table. Telangana VRO 2018 Exam Date has been tentatively declared to be September 9 but it may change as per the conditions. The hall ticket or admit card is the most compulsory thing for any exam so, the candidates should not forget to collect their Telangana VRO Hall Ticket 2018 otherwise you will not be allowed to appear in the examination. Remarks: If you having trouble in downloading your TSPSC Village Revenue Officer Admit Card 2018 then contact directly to the concerned authorities. Moreover, you random doubts are always welcomed.